Take a walk for ten years in Rea Dol’s shoes and you might learn something about the imperialist attitude of NGOs in Haiti. 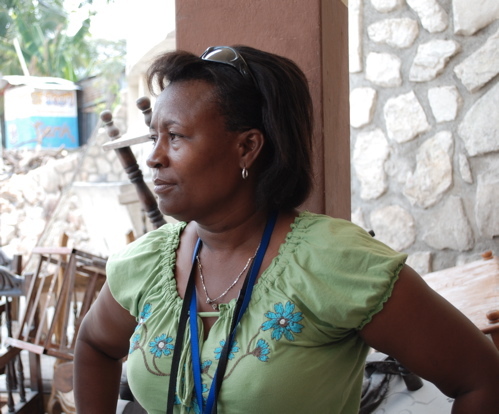 You will also learn something about tenacity, hope, and the indomitable spirit of the women of Haiti. Haitians have a term for it — “Poteau Mitan” — women are the “central pillars” of society. The pillar named Rea Dol was almost lost in the January 12 earthquake that destroyed Port-au-Prince and tore a huge hole in the already shredded fabric of Haitian society. Rea is only one, but she was and is still on a deeply personal mission to repair that fabric as director of SOPUDEP (Society of Providence United for the Economic Development of Petionville), whose membership actively participates in the National Literacy Project. SOPUDEP is a private, licensed school, founded in 2000 by Dol and Andre Jean- Marie. It began as an adult literacy campaign. The day before the earthquake, Rea was in Port-au-Prince to purchase two sewing machines that were to be used in an afternoon program at SOPUDEP. They cost $180 each and it was big decision to make, but the machines would provide added income for some of the 664 kids in her literacy program. The machines needed assembly, so she was scheduled to pick them up two days later, but she had to pay for them first. Now, she cannot even find the shop, let alone the sewing machines. The building was obliterated in the quake. Today, Rea walks in the rubble-strewn courtyard of what was once a school in the hills of Petionville behind the Montana Hotel. Most of the building stands, but it is unusable and unsafe. The smell of concrete dust is still in the air, in this, one of the hardest hit areas south of Port-au-Prince. She has no idea how many of her kids were lost in the quake, but for certain 24 are gone and unknown numbers are buried in the rubble of homes in the neighborhood. Two teachers are dead, and the children who try to return to visit with Rea are too stressed by the knowledge that their classmates are still under tons of concrete to want to stay. Many are “restaveks” — child domestic slave laborers — who were sexually and physically abused and so prefer street life to adoptive parents. They sought shelter in the shadow of the pillar named Rea. Looking over the broken courtyard wall of the SOPUDEP school one sees the familiar sign of Save the Children dominating an undamaged rock wall with a blue metal gate in the center. It is less than 30 yards away. At least ten cars and trucks sit idly in the extensive courtyard that is locked to the surrounding community. While we are watching, a man who looks like he stepped out of the pages of GQ, bluetooth in ear and briefcase in hand, strolls up to the gate, shiny watch visible on his left wrist, and calls to the guard to let him in. We ask if Rea has asked them for help. She all but snorts a reply as she laughs. We looked up the mission statement on their website. In urban areas, including the capital of Port-au-Prince, Save the Children supports welcome centers for street children that provide food and shelter, education and health programs and counseling and play opportunities. Centers offer scholarship assistance so that children can attend school and provide on-site lessons to prepare children for formal schooling. Save the Children also supports children’s rights through direct local interventions and national advocacy. Through a network of children’s clubs, we educate girls and boys on their rights, offers recreational youth activities and endorse positive civic participation. Rea’s vision for the children of Haiti began when she was working with the adult literacy program in the now broken mansion which once belonged to Lionel Wooley. A member of the infamous Tontons Macoutes, Papa Doc Duvalier’s repressive and blood-soaked militia, Wooley died in exile in Miami in 2000. The Haitian government expropriated his property, which was stolen from victims of the Toutons Macoutes. In 2002 SOPUDEP acquired the property under a ten-year lease through the efforts of former Mayor Sulley Guriere of Petionville. The first order of business was to board-up the torture chamber found under the swimming pool. The original literacy campaign was designed for 30-60 adults, but the need was huge and so more came. So did the street children, who wanted to learn and get something to eat in the process. Realizing that children could not learn in the same manner as adults, Rea’s vision was born. She was going to help these kids, and she began by approaching both Plan International and CARE for help. CARE could not have cared less and offered no assistance. Plan International did what they do best and asked Rea for a plan. Rea produced an extensive plan and report for the NGO and they ignored it, but Rea was not going to give up. The Republic of NGOs may not follow their mission statement, but Rea follows hers. A decision was made to dedicate the property to the children of the poor and the homeless restaveks. A sympathetic journalist and filmmaker, Kevin Pina, helped Rea hire an attorney to structure a charter so that the organization could protect the lease and meet government requirements to operate the school. SOPUDUP is funded largely by the Canadian Sawatzky Family Foundation, a registered Canadian charity that was created in 2008 for the sole purpose of providing financial support and raising awareness for Rea’s program. SOPUDUP also receives some support from a national food organization and private donors from around the world. It is not much, but Rea watches the books like a hawk, expenditures are listed on the webpage, and Rea is always thinking ahead. Initial enrollment was 160, but grew to 664 in 2010. She realized the lease would run out in 2012, that they would need more space, and so made plans to purchase a vacant field — raised $40,000 of the $60,000 purchase price, and then January 12 happened. The lesson plan for that date is still on the broken slate board. When the quake hit and Rea realized she was still alive, her first instinct was to get to work. Well, Rea being Rea, she did more than her best — the pillar of hope became a hero — and she will never say that, but I will. Rea strapped a gallon of the surgical disinfectant Betadine to her back and climbed through the devastated hillsides, washing the wounds of the injured as best she could. When possible, she arranged transport for the broken bodies that still held a flicker of life. How did she find the strength? “I have gone beyond what I was the day before the earthquake,” is all she will say. And so Save the Children has done nothing to save Rea’s children. But she continues to try, against all odds. Needs are many. Temporary classrooms are a must, but tents are impossible to come by here. The current school will never be used, but the field is secured at 83 Delmas Road. She needs $20,000 to pay it off completely. Haitian officials have promised tents, but it is doubtful they will arrive. Before the quake, Haiti was the poorest country in the Western Hemisphere. The average income in Haiti is 75 cents to $2 per day, with the cost of food comparable with that of the United States. Today Port-au-Prince can be compared to Mad Max on steroids, but Rea is undaunted and unbowed. So many write and ask me about grass roots programs in Haiti.